Strength training is a vital component to improve your health, accelerate fat loss and reduce the risk of many chronic diseases. Strength training is also important for improving function for your activities of daily living and sporting pursuits. But did you know the strategy you employ for building your strength can dramatically vary the benefits you gain from strength training? When considering the various options for strength training it is important to consider the role of your nervous system plays in movement. Your nervous system and your brain are the controlling mechanisms for all movement – they control how you engage muscles within your body. As such, when you undertake strength training that involves 3-dimensional movements such as free weights and body weight exercises your not only training your muscles; your also training your brain to move efficiently. Whether your undertaking strength training to improve daily function, improve sport or to unlock the health benefits for osteoporosis or managing a chronic disease; undertaking exercises which are dynamic and challenge your nervous system to adapt to better movement function is vital. Below is a summary of the differences between free weights and machine weights – and an overview of the biomechanical differences which exist with the two different training forms. Free weights are the smaller props that you can freely pick up and move around a gym. Free weights usually require you to work against gravity in order to pick up or move the prop. Gyms will have a large range of weight for these props, with the lightest weights usually being 1kg, and the heaviest weight can be upwards of 20, 30 or even 40kg, depending on the gym. Machines Weights are the larger equipment that is often sat on while you push or pull through a particular range of motion. Machine weights usually require you to select your own weight from a stack and put a pin in that chosen weight. Machine weights force your body to move through a fixed plane of movement, which challenge the large force producing muscles but have little activation (stimulation) of the smaller stabilizing muscles. Given the fixed plane of movement with machine weights, they have limited strength transference to daily function or sport due to the multi directional nature of these activities. Evidence suggest machine weights can increase your risk of injury – as they teach your brain to activate the large force producing muscles independently of the important stabilizing muscles used to support the joints (including your spinal joints, shoulders and knees). Lastly, there are Cable Machines. These machines require you to pull a handle or bar that is attached to a cable. The cable can be pulled in a variety of planes of movement at different heights and angles. Cable machines have similar biomechanical properties as free weights because you are required to stabilize the load as you lift it. As such cable machines have similar advantages as free weights. These advantages will be explored in more detail below. Free weight and cable machine activities are commonly more parallel with tasks you perform day to day. For example, performing barbell squats will help you to squat down and pick up a heavy bag. 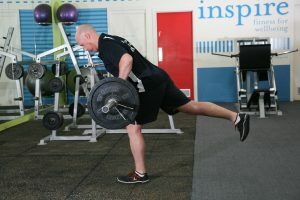 Tasks like this will require you to perform the movement without being locked into a position, and therefore balance may be decreased. Training these movement patterns with free weights or cable machines that replicate the reduced balance will assist you in executing these skills outside of a gym. Rather than being locked into a specific movement plane that occurs in machine based activities, your body can move freely and naturally. Once again, this is more effective for replicating real life movement patterns. Free weights will also make your body less stable than you would be when sitting in or on a machine. Therefore, surrounding ‘synergistic’ muscles will be activated to help stabilise the movement. Machines are highly effective at isolating a muscle or muscle groups such as biceps in a bicep curl machine due to the added stability. However, if you are looking to increase overall strength, free weights will be more beneficial. Another advantage free weights and cable machines have over machines is the greater neural activation. This is an extension of the above mentioned ‘stabilizing muscle’ benefit. Due to the greater requirement of muscle coordination and increased muscle activation, there are larger levels of neuromuscular recruitment. While you may see your muscles growing in size, or feel that you are becoming stronger, it is unlikely that you will acknowledge increases in neuromuscular functioning. However, this is vital, as it allows you to activate a greater portion of muscle mass at any given time. Machines often limit you to performing very few exercises, however, there are endless possibilities for exercises to perform with cable machines, dumbbells, barbells, kettlebells, weight plates etc. You can perform exercises in any plane of motion by pushing, pulling, swinging and carrying these props. Machines are not easily moved, and if you are superhuman and can easily move a machine, then lifting them will become your free weight. However, if you’re like the rest of us mere mortals, then you can use your free weights at home, take them to the park or any other special area you like to exercise. If you want to learn more about free weights and cable machines, or exercises you should be doing to meet your specific training goals, call Inspire Fitness for Wellbeing on 9857 3007 today to talk to one of our Exercise Physiologists or Personal Trainers.